What would you say if you were told that airplanes were regularly spraying toxic aerosols in the skies above every major region of the world? That is exactly what a group of protestors were claiming outside of the annual American Association for the Advancement of Science (AAAS) meeting that was held in San Diego from February 18-22. However, inside the convention center was a different story. The scientists gathered to discuss the “plausibility” of implementing various Geo-engineering campaigns throughout the world, all under the guise that the Earth has a man-made global warming problem that can be solved in-part by spraying aerosol aluminum and other particles into the sky to block the sun. When these scientists were asked about the possibility of existing aerosol programs; they stated that no aerosol spraying programs have been implemented to date. A little confused? Why would protestors gather outside of a meeting making claims that world-wide aerosol programs were under way if scientist were only now discussing the possibility of implementing these programs? Could it be that one of these groups is being deceived? Mauro Oliveira, the Webmaster of Geoengineeringwatch.org, was one of the protestors. He claimed that the program for Stratospheric Aerosol Geo-engineering (SAG), AKA chemtrails, has been well under way around the world. As a matter of fact, Oliveira stated that witnesses from around the globe claim that heavy aerosol spraying is occurring almost every day over just about every city. He went on to explain the difference between a contrail and a chemtrail. 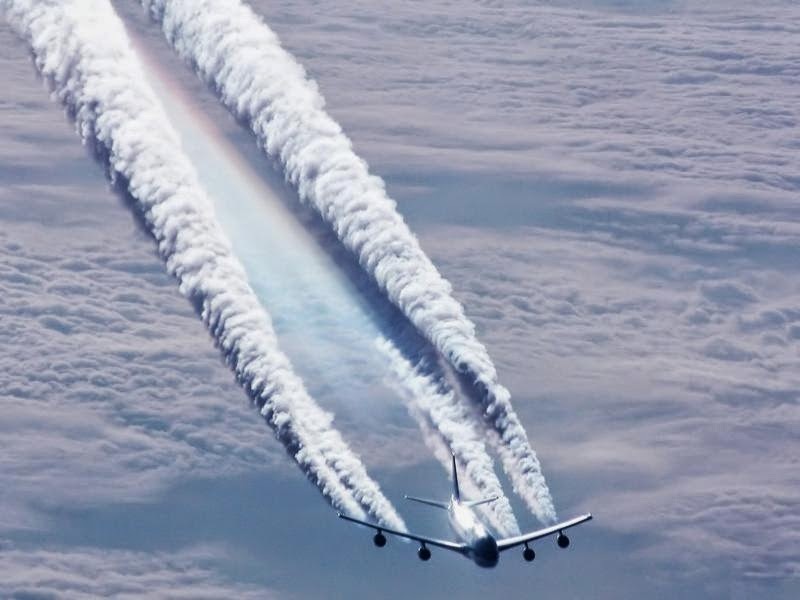 He stated that when a jet airplane flies at a certain altitude, a visible trail of streaks of condensed water vapor sometimes form in the wake of the aircraft. This is called a contrail. Contrails are normal and usually dissipate in a few seconds. They are very similar to when we breathe in cold weather. According to Oliveira, what occurs behind a SAG plane spraying aerosols is quite different. What can be seen is a thick white line also called a chemtrail that lingers in the sky for several hours. The SAG lines are sprayed into the upper atmosphere and then spread out forming what then appear to be clouds. The particles from these aerosols then fall to the ground where they enter our soil and water and can also be inhaled. Another group of protestors had traveled over 10 hours from a small Shasta County community in Northern California. They became concerned about SAG when many from this community began to see dramatic changes not only in the sky, but also on the ground. Trees were dying, grass was not growing and many farmers were having difficulty getting any crops to grow on their farms. The crisis prompted biologists from the community to take action by testing the soil. The results were shocking. Aluminum, barium and other elements were found to be up to thousands of times higher than normal limits. Such high quantities lead to unhealthy PH levels in the soil which can be deadly to ecological life systems. These shocking results led to additional testing of Lake Shasta with samples from the Pit River arm tributary that tested over 4,610 times the maximum contamination level of aluminum allowed in drinking water in the state of California. Also, peer reviewed scientific studies conclude that bio-available aluminum, now found in huge quantities in rain world-wide, is very harmful to flora and thus the eco-system. Ironically, these are the same substances the scientists are considering implementing in the various potential “future” aerosol spraying campaigns that were being discussed at the meeting. A large number of other protesters became interested in SAG after experiencing burning eyes, migraine headaches, anxiety, irregular heartbeat, high blood pressure and other health problems on days that airplanes were allegedly witnessed spraying aerosols in the sky. Deborah Whitman, Founder and President of the non-profit environmental organization Environmental Voices and also Producer of the documentary “Sky Lines” is no stranger to these symptoms. She has been hospitalized over 51 times on what she calls “heavy spraying days”. Whitman has committed her life to helping people who claim to be experiencing similar problems resulting from aerosol spraying and gets calls from all over the U.S. in response to her website and documentary. Her recommended health tips can be found at www.environmentalvoices.org. Other indicators that possibly validate the claim that SAG is connected to health problems are the respiratory mortality rate, which has risen from eight on the list of mortality to third in the past five years, and the fact that Alzheimer’s and other illnesses linked to aluminum have continued to rise around the globe at astronomical rates since the inception of the alleged spraying. The AAAS meeting hosted some of the world’s leading geo-engineering scientists. With years of education and even more experience in their respected fields, the scientists looked at geo-engineering issues from many angles. Workshop subjects ranged from, the effectiveness of geo-engineering to potential problems and even touched upon the issue of ethics. According to independent reporter Stewart Howe of Los Angeles, all of the scientists seemed to be looking for solutions to what they believe is the problem of global warming. Howe stated that the scientists appeared to be carefully weighing both the pros and cons of SAG when presenting potential campaigns to address the man-made global warming theory. Many were actually advocating alternative methods to combat this issue due to the potential risks of SAG that include droughts, ozone depletion, less solar power, decimated weather patterns, military use of technology and other various environmental impacts. Howe said, “after witnessing the aerosol spraying for years, I was surprised by the discourse among scientists.” Stewart went on to say that he believes that most of the scientists attending seemed to be separated from the knowledge of any current SAG deployment. As a matter of fact when asked about current SAG operations, leading geo-engineering scientist Ken Caldiera replied that he was unaware of any current aerosol spraying operations and when prompted to explain the long lingering trails left behind planes, he stated that they are simply normal contrails from jets. David Keith, another leading scientist and expert in the field of geo-engineering, discussed the well-funded studies that have been conducted to predict potential future risks as well as benefits associated with geo-engineering. Some of the potential benefits include a cooler planet, and the reduction of melting sea ice and rising sea levels. Keith discussed what aerosol particles would be most effective in achieving the stated goals of the SAG program. He went on to say that initially sulfur was considered, however, aluminum is more effective and can be used by adding ten to twenty mega-tons per year into the stratosphere. When asked about health related studies that have been conducted to predict the potential risks of adding the particles in our air, Keith stated that many studies have been completed and indicate few risks. However, when asked specifically about the use of aluminum as an aerosol, he said “we haven’t done anything serious on aluminum, so there could be something terrible that we will find tomorrow that we haven’t looked at.” After the meeting, Keith showed consideration to the protesters by initiating a discussion about the SAG program outside where the protestors were standing. When confronted with concerns about SAG deployment from the group, he went on to say that he shared similar views and is against any deployment until proper research is completed to determine potential risks of aerosol spraying. He also went on to say that he is unaware of any current SAG operations, but, would be willing to look at any scientific proof if presented to him. As the skies around our world continue to change, there is strong evidence that points toward current deployment of massive aerosol operations. Could it be that scientific data and studies are being used to implement pre-mature full-scale SAG programs with-out the knowledge of the top scientists who are involved with the research? 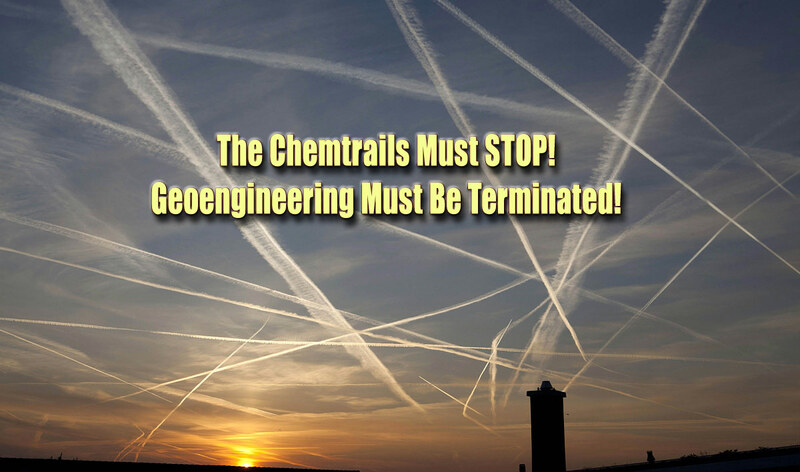 If so, what kind of ethical considerations can we expect from the geo-engineering community in the future? It is hard to believe that the strange white lines in the skies witnessed around the world and the toxic elements found in the soil, water and air are from an unrelated source. We the people, in partnership with the scientific community need to challenge not only the environmental and health risks associated with SAG but also the numerous world-wide allegations about current deployment. It is imperative that we become educated and involved in uncovering the truth of this alleged crime against both nature and humanity. The future of our planet depends on it. As concerns continue to grow around the world about this issue, additional information including meet-up groups can be found on various chemtrail and geo-engineering websites.